Before winter hits, Tooele County School District plans to have every elementary school equipped with an outdoor air quality sensor. Junior high and high schools are on track to have sensors installed by the end of the school year. Each sensor measures a variety of harmful airborne particulates such as smoke, soot and a common pollutant known as PM2.5. Schools can use results from the sensors to determine if students should stay inside for recess to avoid inhaling potentially harmful air. During winter months when temperature inversions are common, air quality is more likely to be poor. Inversions are caused when warm air traps cold air and pollutants beneath it. With winter fast approaching the school district is pushing to have elementary school sensors installed first since younger children are more susceptible to problems linked to raised levels of particulates. Overlake Elementary was the first school to have a sensor installed thanks to a donation from KSL last school year during a visit from Meteorologist Dan Guthrie. 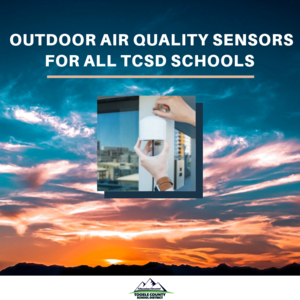 TCSD Superintendent Scott Rogers liked the concept and wanted to ensure each school had the ability to monitor air quality for students and staff. Since then, TCSD has purchased outdoor air quality sensors for each school and the district office.